"The Lord deals with the nations as the nations deal with the Jews." Certainly when we look at the miserable state of Russia, where of all countries in the world the Jews were the most cruelly treated, and contrast it with the fortunes of our own country, which seems to have been so providentially preserved amid the awful perils of these times, we must admit that nothing that has since happened in the history of the world has falsified the truth of Disraeli's confident assertion. There can be no greater mistake than to attribute to each individual a recognizable share in the qualities which make up the national character. There are all sorts of men—good, bad and, for the most part, indifferent—in every country, and in every race. Nothing is more wrong than to deny to an individual, on account of race or origin, his right to be judged on his personal merits and conduct. In a people of peculiar genius like the Jews, contrasts are more vivid, the extremes are more widely separated, the resulting consequences are more decisive. First there are the Jews who, dwelling in every country throughout the world, identify themselves with that country, enter into its national life, and, while adhering faithfully to their own religion, regard themselves as citizens in the fullest sense of the State which has received them. Such a Jew living in England would say, "I am an Englishman practicing the Jewish faith." This is a worthy conception, and useful in the highest degree. We in Great Britain well know that during the great struggle the influence of what may be called the "National Jews" in many lands was cast preponderatingly on the side of the Alies; and in our own Army Jewish soldiers have played a most distinguished part, some rising to the command of armies, others winning the Victoria Cross for valour. The National Russian Jews, in spite of the disabilities under which they have suffered, have managed to play an honourable and useful part in the national life even of Russia. As bankers and industrialists they have strenuously promoted the development of Russia's economic resources, and they were foremost in the creation of those remarkable organisations, the Russian Co-operative Societies. In politics their support has been given, for the most part, to liberal and progressive movements, and they have been among the staunchest upholders of friendship with France and Great Britain. In violent opposition to all this sphere of Jewish effort rise the schemes of the International Jews. The adherents of this sinister confederacy are mostly men reared up among the unhappy populations of countries where Jews are persecuted on account of their race. Most, if not all, of them have forsaken the faith of their forefathers, and divorced from their minds all spiritual hopes of the next world. This movement among the Jews is not new. From the days of Spartacus-Weishaupt to those of Karl Marx, and down to Trotsky (Russia), Bela Kun (Hungary), Rosa Luxembourg (Germany), and Emma Goldman (United States), this world-wide conspiracy for the overthrow of civilisation and for the reconstitution of society on the basis of arrested development, of envious malevolence, and impossible equality, has been steadily growing. It played, as a modern writer, Mrs. Webster, has so ably shown, a definitely recognizable part in the tragedy of the French Revolution. It has been the mainspring of every subversive movement during the Nineteenth Century; and now at last this band of extraordinary personalities from the underworld of the great cities of Europe and America have gripped the Russian people by the hair of their heads and have become practically the undisputed masters of that enormous empire. 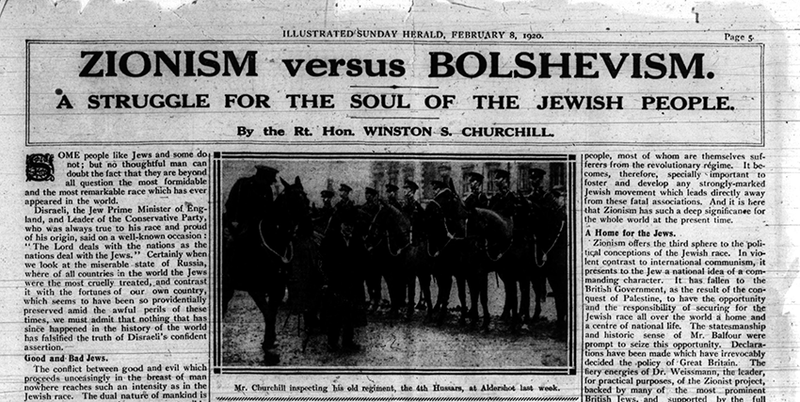 There is no need to exaggerate the part played in the creation of Bolshevism and in the actual bringing about of the Russian Revolution by these international and for the most part atheistical Jews. It is certainly a very great one; it probably outweighs all others. With the notable exception of Lenin, the majority of the leading figures are Jews. Moreover, the principal inspiration and driving power comes from the Jewish leaders. Thus Tchitcherin, a pure Russian, is eclipsed by his nominal subordinate Litvinoff, and the influence of Russians like Bukharin or Lunacharski cannot be compared with the power of Trotsky, or of Zinovieff, the Dictator of the Red Citadel (Petrograd), or of Krassin or Radek - all Jews. In the Soviet institutions the predominance of Jews is even more astonishing. And the prominent, if not indeed the principal, part in the system of terrorism applied by the Extraordinary Commissions for Combating Counter-Revolution has been taken by Jews, and in some notable cases by Jewesses. The same evil prominence was obtained by Jews in the brief period of terror during which Bela Kun ruled in Hungary. The same phenomenon has been presented in Germany (especially in Bavaria), so far as this madness has been allowed to prey upon the temporary prostration of the German people. Although in all these countries there are many non-Jews every whit as bad as the worst of the Jewish revolutionaries, the part played by the latter in proportion to their numbers in the population is astonishing. Needless to say, the most intense passions of revenge have been excited in the breasts of the Russian people. Wherever General Denikin's authority could reach, protection was always accorded to the Jewish population, and strenuous efforts were made by his officers to prevent reprisals and to punish those guilty of them. So much was this the case that the Petlurist propaganda against General Denikin denounced him as the Protector of the Jews. The Misses Healy, nieces of Mr. Tim Healy, in relating their personal experiences in Kieff, have declared that to their knowledge on more than one occasion officers who committed offenses against Jews were reduced to the ranks and sent out of the city to the front. But the hordes of brigands by whom the whole vast expanse of the Russian Empire is becoming infested do not hesitate to gratify their lust for blood and for revenge at the expense of the innocent Jewish population whenever an opportunity occurs. The brigand Makhno, the hordes of Petlura and of Gregorieff, who signalised their every success by the most brutal massacres, everywhere found among the half-stupefied, half-infuriated population an eager response to anti-Semitism in its worst and foulest forms.